When you purchase an iTunes download of any of the 10 episodes of How The States Got Their Shapes, you can get an idea of just how popular a particular episode is from the popularity bar. All the episodes except two have only one bar filled in popularity. The penultimate episode, Episode 9, is a little more popular because it has 2 bars filled on the popularity scale. The last episode, Episode 10, “Mouthing Off”, the one in which I appear, has all 12 bars filled on the popularity scale. It appears the show in which the Independent Long Island flag was spread out had a lot of fans. Are people beginning to genuinely fall in love with the Independent Long Island flag or the Long Island Statehood issue? Only time will tell, but the beginnings look very promising. He is no longer the “Governor” of Independent Long Island officially, since he is the Curator of Independent Long Island now (the reason for that), but the taped piece on How The States Got Their Shapes, episode “Mouthing Off”, was pretty good, we have to admit. And Independent Long Island (ILI) got shown a lot more than just vicariously, a lot more than just some appendage of New York State, Lon Guyland accent included! My presentation in the film turned out to be even less than a cameo appearance, as they only showed me for a second in the episode, and only to answer a question (about “the secessionist movement most likely to secede”) with the answer of “Texas”. No mention of Independent Long Island (ILI) at all. No showing of the ILI flag, even though they taped that stuff. Of course they totally trivialised the issue of secession/independence, which was to be almost expected, but they also completely wasted my time, and some really good footage. Never again will I devote serious time with the media about Independent Long Island. Never again. Note about Cesidio Tallini’s insignificant appearance in: State of Rebellion (2011). Host: Bryan Unger; Director: Ann Carroll. “How The States Got Their Shapes”. A&E Television Networks. History (TV channel), New York. 2011-05-24. “We saw your latest entry on your website yesterday, and I just wanted to assure you that the clip in which you appeared will not be your only appearance in How The States Got Their Shapes. The vox pop segment you saw on Tuesday night, and in which you appeared, is a signature part of our series — we have different people from across the country answer questions on a variety of subjects, and these vox pop pieces are interspersed throughout every episode. Often, the same interviewee will appear in a number of episodes, answering questions on different subjects. “You will be featured at greater length in a later episode, which will include your views on Long Island independence. Looking back at older email communications between Zoe and I, the series is indeed described as, “a ten-part American geography and history series which will travel across the country investigating the stories behind the making of state shapes and state identities.” Since only four parts have been premiered on the History Channel so far, and a fifth episode, “Living on the Edge”, is scheduled to premier on 7 June 2011, well then perhaps Zoe is right. I will stay tuned, and hopefully among the other interesting story lines, a respectable secessionist- or independence-minded perspective will emerge, perhaps even a Vox intelleget servi mei, vox Dei est perspective (“The voice of my wise servant, is the voice of God”), the perspective which apparently has a higher reason to exist. Quasi errata addendum about Cesidio Tallini’s insignificant appearance in: State of Rebellion (2011). Host: Bryan Unger; Director: Ann Carroll. “How The States Got Their Shapes”. A&E Television Networks. History (TV channel), New York. 2011-05-24. Update posted on 2011.05.26. On 2 March 2010, a policy of Independent Long Island (ILI) realpolitiks was enacted. As a result of this, the leader of the Independent Long Island downgraded his title from Governor to Curator, curator as in keeper of a cultural heritage institution. The Independent Long Island project is no longer a political project. This means Independent Long Island will no longer behave like a political project, so we will no longer accept recognition from other nations or national projects. We will also no longer count any new citizen or national, as the number of these is completely insignificant compared to the number of actual Independent Long Island residents, some 7.6 million. Independent Long Island is no longer a member nation of the United Micronations Multi-Oceanic Archipelago (UMMOA). Just as new member nations are no longer accepted from nations that are too ephemeral, Independent Long Island is no longer significant enough to be accepted either. Moreover, the nation of TTF-Bucksfan will no longer be among the member nations either, not because it is insignificant as a micronation, but because it is already a de facto physical part of the UMMOA, since The Tallini Family is already registered as a municipal corporation, which is part of the Fifth World Community, which in turn is a United Micronations Multi-Oceanic Archipelago (UMMOA) diaxenospitia. Not only has Independent Long Island never developed into a real nation of any significance, but in reality it is also obsolete since the development of diaxenospitias, perhaps also because secessionist movements within multicultural societies are fundamentally ephemeral by nature. So from now on Independent Long Island is a cultural heritage institution, just as any Italian-American organisation is not a nation, or a state, or not even a nation in exile, but a cultural heritage institution. The Hon. Most Rev. Dr. Cesidio Tallini will also be Independent Long Island’s realistic curator, rather than an out-of-place or eccentric governor. Folks, it is beginning to happen. As the image below found in the Wikipedia’s Long Island article shows, some Long Island folks are beginning to fall in love with our flag! As we said yesterday, it doesn’t happen everyday even in the Official World. The National Child Identification Program (NCIDP) was created in 1997 by the American Football Coaches Association, as a community service initiative to help protect America’s youth, and change the statistics related to missing children. Approximately 800,000 children go missing every year. That’s one child every 40 seconds. Currently there are active NCIDP programs in 13 states (out of 50). The reason there are so few active programs should be fairly obvious once the details are given. The NCIDP provides parents and guardians with a convenient way to record their child’s fingerprints and physical characteristics on a card they can keep at home. Of course, many parents are uncomfortable with their child’s fingerprints even if they are kept at home. 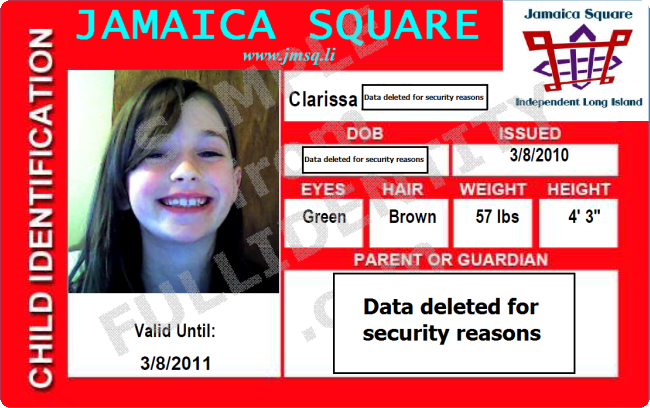 On 8 March 2010, the world’s first municipal child ID cards for a macronational city were issued by the city of Jamaica Square, Independent Long Island (ILI). There was no need for fingerprints or other invasions of privacy, however, and the Mayor of Jamaica Square is going to thumb his nose, again, at Montevideo Convention extremists in the micronational community, who still believe ID cards or passports should be issued only by territorial micronations, even though child ID cards can be made, and are made by several private firms for parents and guardians, because there is an obvious need for them. We believe the security of our loved ones is too precious a thing to be left entirely to the whim of Official World governments, and so two cards were issued to the nieces of the Mayor of Jamaica Square. Don’t teach a man to fish! By the way, if you are wondering how these taxes came to existence, look no further than the United Nations Food and Agriculture Organization (FAO). In 2001, the FAO, through its Committee on Fisheries, adopted the International Plan of Action to prevent, deter and eliminate Illegal, Unreported and Unregulated Fishing (IPOA-IUU). The IPOA-IUU is a “voluntary instrument” listing a host of measures that countries and regional fisheries bodies should adopt, depending on the nature of their fisheries, in order to eliminate IUU fishing. In order to adopt IPOA-IUU measures in a consistent way, countries were encouraged to develop their own National Plan of Action to prevent, deter and eliminate Illegal, Unreported and Unregulated Fishing (NPOA-IUU), sourcing measures from the ‘tool box’ represented by the IPOA-IUU, and adapting them to their particular situation. Countries were encouraged to have their NPOA-IUU action plans developed by the end of 2004 (source). In the United States, the responsibility for the NPOA-IUU came under the National Oceanic and Atmospheric Administration (NOAA). It is interesting to note that in their “National Plan of Action of the United States of America to Prevent, Deter, and Eliminate Illegal, Unregulated, and Unreported Fishing” (link) there is a lot of mention of commercial fishing activities as sources of IUU activities, including mention of the Magnuson-Stevens Fishery Conservation and Management Act, the High Seas Fishing Compliance Act, and the Lancey Act as obvious regulatory instruments. There is no mention, however, of recreational anglers. The reason is clear: they are not part of the problem. The Secretary [Secretary of Commerce] must establish a fund to improve fishery harvest data collection, cooperative fishery research and analysis, and development of new technologies. The fund must also be used to analyze the health benefits and risks of seafood, market sustainable U.S. fish products, improve recreational data collection, and provide financial assistance to fishermen to offset their costs with implementing changes to meet the requirements of federal laws. Amounts generated from quota set-asides, appropriations received for the fund, and monies from states or other entities may be deposited into the fund. Every two years, money from the fund will be apportioned among the eight Council regions (source). It is interesting to note that the regulations are entirely designed to control commercial IUU activity, but guess who will be financing the whole thing, even offsetting the implementation costs to fishermen, and under the guise of “improv[ing] recreational data collection”? You’ve guessed it: the poor recreational angler, who already pays too much money just for the satisfaction of pulling in a few fish by hand! So what started as a quasi-mandate by a UN agency, ended-up becoming another tax in disguise. Notice that the fees paid by recreational anglers are supposed to “improve recreational data collection”, something which really doesn’t require regulation or even immediate mandates. Yet now since the states are using these new fees as additional income to fill-in holes, soon, if you are caught fishing without a license, you will even be paying fines between $0 to $250 per fishing violation, and/or be spending 15 days in jail! Sure! “[I]mproved fishing opportunities” are what we are supposed to get, but do they actually feed the fish in the sea, or do something like that? Of course they do! Doesn’t the government also provide you with all of those paid privileges called ‘rights’, including the one that doesn’t really count to most employers, the First Amendment? Don’t they provide you with the sun in the morning, something which you ingrates don’t even get taxed for? And shouldn’t you also pay taxes on the water out of the well you’ve dug on your own property, and at your own expense? Comments Off on Don’t teach a man to fish!